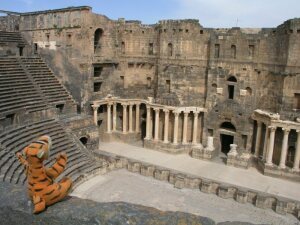 (848 m) Hidden inside an Arab fort is the magnificent amphitheatre of Bosra or Bostra as the town was called by the Romans. The Colosseum of Rome may be bigger, the amphitheatre of Bosra is much better preserved. Dutch: "6 cylinder petrol, a very powerful engine!" (1462 m) Three amphitheatres in one day! Look at the complete list on the GPS page. 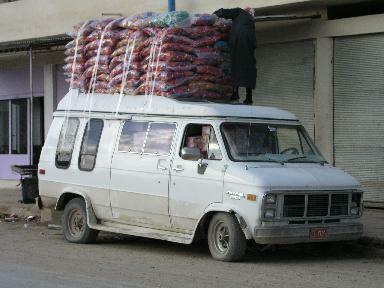 (708 m) Back again in Damascus to arrange our trip to Lebanon. However, at the border they refused to let us out of the country because we did not bring our car... We knew this could be a problem, but if you don't try, you'll never know. (291 m) Those water wheels are noisy! The huge wheels, norias, are not needed anymore for irrigation purposes, but they do work as a city wide airconditioning. We found Hama a very comfortable city. 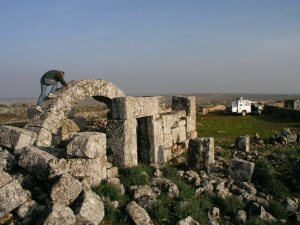 (262 m) Unlike Palmyra, Apamea (Afamia) is located on green hills were vegetables are grown and cattle is kept. The colonnaded street is amazingly long. The Byzantine village of Bauda. 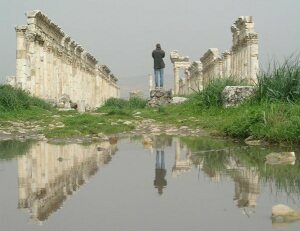 The colonnaded street of Apamea. (689 m) The Dead City of Bauda is not so famous, but its quiet setting in rocky meadows makes it a perfect camping spot. (694 m) In the hills south of Aleppo dozens of so-called Dead Cities are located. Why these Byzantine villages were abandoned is still a matter of dispute. The setting is most of the time superb. The ruins of Al Bara are set between olive orchards. (sea level) The major port of Syria, with nearby the remarkable ruins of the Bronze Age city Ugarit. (375 m) Around a Byzantine castle the Crusaders build an even bigger castle. But this castle was build by the Crusaders themselves and not by experts like the Tempelers or the Hospitalers. So Saladin had not much difficulties in finding a weakness in the defences and the Crusaders could enjoy their building efforts for only 70 years. After the siege by Saladin, the beautiful located castle was named after its conquer. (338 m) High on the cliffs are the black ramparts of Qalaat Marqab, one of the many Crusader castles in the Middle East. Not so massive as the Krak and not so nicely located as Qalaat Saladin, but how sad for this castle to have such a competition. (sea level) The Crusader base of Tortosa is absorbed in the town Tartus. It gives this not very interesting beach resort a nice atmosphere. (662 m) This castle is massive! 900 years did result in some scratches, as did months of siege, but this Mother of all Crusader castles seems to be in the same league as the Pyramids - too massive to be destroyed by man and time. 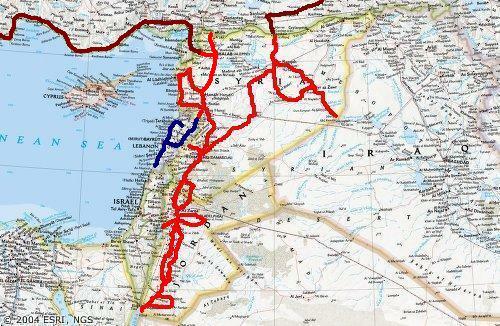 (708 m) Mentioned as Dimashqa on clay tablets dating from 2500 BC, Damascus is probably the oldest permanently inhabited city in the world, although cousin Aleppo is maybe just as old. History is alive here. The Via Recta, mentioned in the Bible, is still a busy street and the superb Umayyad mosque has been a place of worship for almost 1300 years. (421 m) It makes no sense to try to describe the magnificent ruins of Palmyra in a few sentences. The city was "rediscovered" 1678 and before that nobody imagined that the city of the legendary queen Zenobia really existed. Zenobia tried to make the city independent of Rome in the 3rd century AC. A bad idea, of course. (316 m) The Byzantine fortress city Sergiopolis (Resafe) was named after the Roman soldier St. Sergius who was martyred here in 305. 1500 years of conquests and earthquakes transformed the city into lovely situated ruins, now mainly used as grazing ground for sheep. 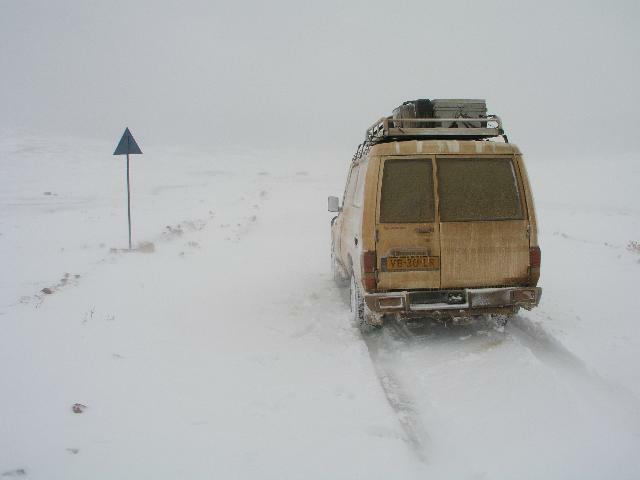 After a short visit at the remains of a Roman temple at Isrya we spend the night in the desert between Israya and Palmyra, ending up in a half a meter of fresh snow...! (368 m) A perfect camping spot next to a fine Arab desert castle. (214 m) Deir-ez-Zor is a pleasant city from where we visited the famous Greek-Roman ruins of Dura Europos and Halabiye (Zenobia), the Mesopotamian ruins of Mari, the Arab castle ar-Rahba and, of course, the border with Iraq. Especially Dura Europos is a nice site located on the shores of the Euphrates river, although its spectacular findings, an intact synagogue, was moved to the National museum of Damascus.